There are certain types of orthodontic problems that are caused by the upper arch lacking enough space for all of the upper teeth. In other cases the roof of the mouth may be so narrow as to impend on speech and breathing through the nose. In all of these cases a palatal expander is the ideal appliance of choice. The maxilla or upper jaw has a suture or joint in the center. This joint is made of fibrous material and as long as you are still growing, it will stretch. Your appliance will fit in the roof of your mouth and will spread your upper jaw apart allowing enough room for your orthodontist to fit all your upper teeth into their proper location in your arch. Your orthodontist may or may not put braces on your teeth at the same time that you are wearing your RPE. The best way to tell if your RPE is working is you will develop a space between your two front teeth. DON’T PANIC! The space will be closed, it is a way for your orthodontist to judge if the appropriate amount of space has been made. The RPE is "activated" by a series of "turns" every 24 hours. Instructions will be given at the time of the RPE delivery. The most comfortable way to have your appliance turned is to lay on a bed or sofa with your head lying off the edge. You will be given a special key to turn your appliance with. With your head tilted back and your mouth wide, your parent should have easy access to the holes that need to be turned. The key should slide into the hole and pushed toward the throat until the next hole is visible. DO NOT REMOVE THE KEY UNLESS YOU CAN SEE THE NEXT HOLE! You may feel an itchy feeling or slight pressure under your nose lasting no more than 10 seconds. If you ever experience pain you must inform your orthodontist immediately. Remember to keep your appliance clean! Swishing with water or mouth rinse and brushing is very important. A WaterPik® is very helpful in removing food that will be trapped in the appliance. It is very important to stay away from hard, sticky, chewy foods and candy at this stage of treatment. If you feel the RPE coming loose or rocks on either side call our office immediately. It is important that the appliance be re-cemented to prevent food from collecting around it which will lead to a gum infection. After you stop turning your appliance it will remain in the mouth for several months in order to maintain the space created. Be patient, orthodontics is a process that takes time. Moving teeth and bone sometimes can be uncomfortable and tedious. But as in many things in life a little effort now will have a big payoff later. YOUR INCREDIBLE SMILE!! One of the most common problems facing orthodontists is the correction of malocclusions dealing with large overbites. The orthodontic term for this problem is Class II malocclusion. 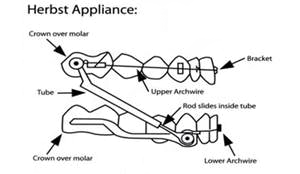 In the past, most of these malocclusions were treated by using headgears, rubber bands, or surgery. In most instances, the improper bite is caused by a lower jaw that is too far back in relationship to the rest of the face. A good indicator of the presence of this problem would be a patient in which the upper lip is balanced with the rest of the face and when sliding the lower jaw forward it creates a more pleasing profile. When the patient is still growing, it is possible to promote the growth of the lower jaw to catch up with the upper face by using an appliance called a Herbst. 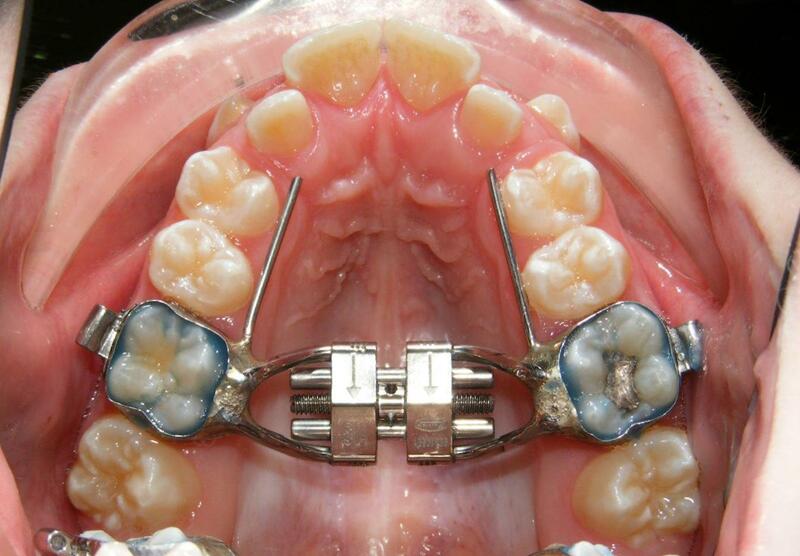 The Herbst is a functional orthopedic appliance because it positions the patient’s lower jaw in a forward direction. It is permanently attached to the teeth for approximately twelve months. Over this treatment period, the forward posture of the lower jaw promotes growth in the same direction. Even though the Herbst appliance prevents the lower jaw from moving backward, opening and closing movements still occur easily and patients have very few problems learning to chew their food with their lower jaw in this new position. 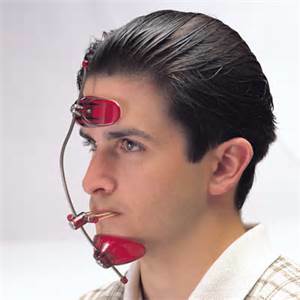 Facemask or reverse-pull headgear is an orthodontic appliance typically used in growing patients to correct underbites (technically termed Class-III orthodontic problems ) by pulling forward and assisting the growth of the upper jaw (maxilla), allowing it to catch up to the size of the lower jaw (mandible). Facemasks or reverse-pull headgear needs to be worn approximately 14 to 24 hours per day to be truly effective in correcting the underbite, usually anywhere from 12 to 18 months depending on the severity of the bite and how much a patient is growing. The appliance normally consists of a frame or a center bars that are strapped to the patient's head during a fitting appointment. 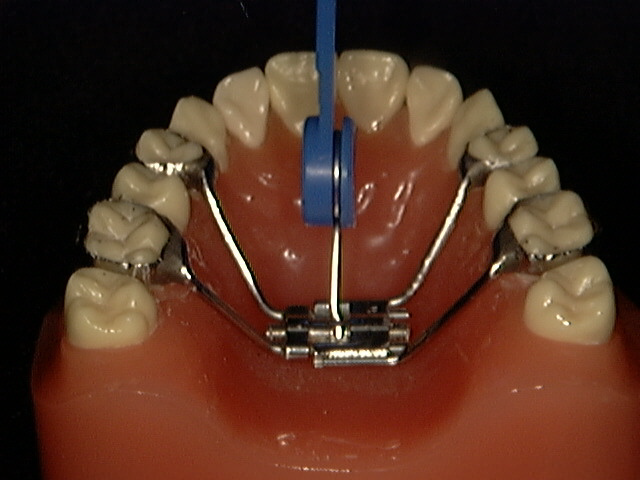 The frame has a section which is positioned in front of the patient's mouth, which allows for the attachment of elastic or rubber bands directly into the mouth area. 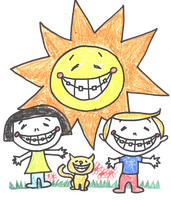 These elastics are then hooked onto the patient's braces (brackets and bands) or appliance fitted in his or her mouth. This creates a forward pulling force to pull the upper jaw forward. An appliance is anything the orthodontist attaches to your teeth to move your teeth or to change the shape of your jaw. If you are familiar with these terms it helps us to understand you better should you call with questions. 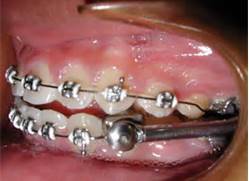 Arch Wire - A metal wire which is inserted into your brackets to move your teeth. Band - A metal ring that is usually placed on your molars to serve as an anchor. Bracket (brace) - A metal or ceramic part that is glued onto a tooth and serves as a handle to move it. Buccal Tube - A small metal tube that is welded on the outside of a molar bank. The buccal tube contains slots to hold arch wires, lip bumpers, facebows and other appliances your orthodontist uses to move your teeth. Module (O-ring) - A small plastic piece, shaped like a donut, which is used to hold the arch wires in the brackets on your teeth. O-rings come in various colors as shown in the color wheel above. Mouthguard - A device that is used to protect your mouth from injury when participating in sports. The use of a mouthguard is especially important for orthodontic patients to prevent injuries. If you need one just ask an assistant! Retainer - A device that the orthodontist gives you to wear after they remove your braces. The retainer attaches to your upper and/or lower teeth and holds them in the correct position. You wear the retainer at night to make sure that none of your teeth move while your jaw hardens and your teeth get strongly attached to your jaw. Retainers can either be permanent or removable. Separator (spacer) - A small plastic ring which is placed between the teeth to create a space between your teeth for bands. Wax - This clear wax is used to prevent your braces from irritating your lips when your braces are first put on, or at any time your braces rub the inside of your mouth causing irritations. Sterilization Policy - Our office is committed to meeting or exceeding the standards of infection control mandated by OSHA, the CDC and the ADA.